My new toy, er tool, arrived last evening. After two weeks without a tractor/mower, my replacement arrived last evening. It was unceremoniously off-loaded from the delivery truck and placed at my feet by two guys who almost dropped it. Well it is almost 600 pounds and the ramp was a bit narrow. Not a real good beginning. To say that I was excited about receiving it is an understatement. 24 horses of Briggs and Stratton engine powering a 46 inch mower deck on a Craftsman tractor ready to make short work of my lawn. And it did. Raw power, tight turning radius. I had bought the bagger last weekend. It was ready. Amazingly, it installed in less than about 20 minutes and was ready for work. The lawn looked great when I was done. I do miss my old tractor--but the new one is really powerful. And it made short work of the lawn especially with its tight turning radius. Out with the old and in with the new. Does anyone need a used tractor with a non-working engine? Monday's trek home from Ocean City was, in a word, long. Traffic was snarled for over 30 miles from Easton to the Bay Bridge and it was so hot in the sun that we actually put the top up on the car because we were baking like muffins in an oven. What a downer on a perfect weekend. And it happens every year, although usually I am not in the traffic. For all of the money Ocean City generates and for all of the now increased taxes were are being gouged by, it would seem that the State would do something to ameliorate the problem. But no--running a "Click it or ticket" seat belt campaign seems more important. That is almost as futile as the drug war. Pouring good money after bad. If people are not wearing seat belts by now, I am not convinced that there is a way to change their behavior. And the road to and from Maryland's premier vacation area continues to shrink in the face of increasing demand. The taxes generated by the tourists and visitors to Ocean City alone should be enough to fix the roads. Five hours to complete a normal two-and-a-half hour trip seems a bit excessive. It leaves me with a bad taste in my mouth and a sore spot on my bottom. 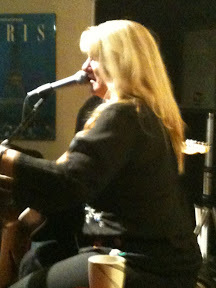 Saturday night, Cellar Music sponsored a house concert featuring Patty Reese accompanied by Dave Chappell on guitar. The venue continues to be a great place to experience artists up close and personal. This concert was very well attended and so there was a lot of conversation and food and drink before the concert actually began. That perhaps is one of the great aspects of house concerts--the intimacy and the relaxed atmosphere. There was no annoying bag check to get into the house! Dave Chappell was awesome performing as the second guitar to Patty. His riffs and fills added significantly to the experience and it was clear he was experienced in working next to Patty. It was also evident that he is an experienced and excellent guitarist. I enjoyed listening to his music almost as much as the headliner for the evening. Patty put on a solid performance. She worked the crowd well and was personable and approachable. I felt her vocals were reminiscent of Janice Joplin with a raspy and folksy quality. Her songs were well written and told excellent stories. The lyrics made sense and worked well with the music. I could tell that her songs are designed to highlight the best qualities of her voice. They were compelling to listen to, and I'm sure with a bit more familiarity I would be humming some of the tunes. Bottom line--Cellar Music did it gain. Way to go Gary and Pam. 1. Happy Memorial Day. The summer begins. 2. There is something soothing about waking up and seeing the ocean waves crash onto the shore. 3. Holiday weekends seem to pass too quickly. 4. Traffic is terrible, but isn't it cool that so many other people are doing the same thing. 5. I bought a new tractor the other evening. It is like Christmas in May waiting for it to be delivered. I already have one key and the nagger for it. 6. Seriously, what do you do with a broken tractor? Craigslist! 7. I am sitting here looking at the ocean waiting until it is time to hit the beach. 8. Has any candidate really touched on the true issues we need addressed this Fall? Guess where? I woke up in my own bed this morning and by 8:30 I was in Ocean City looking at the beach and ocean. Bring on summer and let the good times roll. I fell into the white adirondack chair on the deck with my coffee to enjoy the morning. The holiday weekend is at hand and it is going to be at the same time busy and fun. By the end of weekend I hope to be walking on a beach. But to start the weekend I'll be walking through the dump and recycling area. I will likely be borrowing my neighbor's tractor again to mow--since the refurbished one that I bought will not be delivered until Wednesday. And somewhere in there is shopping, and tonight a house concert to enjoy. 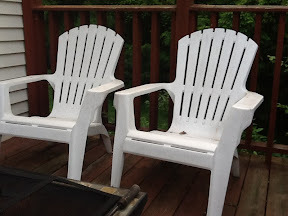 For now though, I am on the deck in my chair--did I mention that it was wet with morning dew when I fell into it and so now I am damp? And the birds are singing. Or screeching. The morning is alive and I can actually pause and be part of it. I am not good with bird calls, but I hear a cat bird, a mocking bird, the racket caused by a woodpecker finding breakfast, a couple of cardinals, and many other birds filling the morning air with the sounds of life. The warm, humid air with a hint of honeysuckle mixed in assaulted my nostrils as I walked through the doorway following the thunderstorm. Although I had expected the air to be cool, crisp and clean; washed by the storm, it was not. Instead it was full of musky odors. It was damp and alive with the smells of life. I enjoyed the smells of the freshly mulched flowerbeds as I stood there on the porch. The dark clouds that had brought the storm were clearing and I could see stars beginning to fill the space between them encouraged by the fast approaching darkness. The honeysuckle in the breeze was light, wafting and enticing me to pause and enjoy the moment. It was a magical moment, caught between the ending of the day and the clearing of the storm. A timeout on the playing field of life for a reset. And then, Makayla, my dog, reminded me why I had opened the door to venture out in the first place and the spell was broken. I read a funny item from 2002 yesterday which shows the extremism to which some people can take things. It is titled Why Can't I Own a Canadian. Taken out of context we can run afoul of the most well meaning things. Why don't we sacrifice bulls anymore? Or any of the other things referenced? I guess if you have to think about this too long, we need to have a talk. Maybe it has something to do with Romans 10:4. Remember a few weeks ago the media attention that focused our attention on the moon that was supposed to appear 10 percent larger because the full moon was going to occur perigee? I looked at the moon that night. It was bright, but how does one measure an additional 10 percent of moon brightness and size? It didn't seem bigger-and in truth, it wasn't. 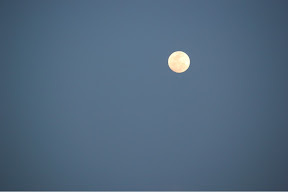 It was the same old moon--I just took time to notice it. Like the blue sky on Sunday. So clear and blue that it seemed like I would get lost in it. And for a while, I did get lost in it as it enveloped me and I drifted off to sleep under its vast covering. Did it seem bigger then? No clouds; just blue sky adding depth to the scene behind the trees and buildings. The same sky that has always been there. I just took time to notice it. Sometimes I just need to slow down and notice the world around me and then the things I have always accepted and seen will look new and different. I looked at my lawn last evening after nearly a day of rain. Although freshly mowed on Saturday, it was already beginning to get long and scraggly. A sure sign that I was going to need to mow again soon. Oh yeah, I still do not have a mower. Even my broken lawn tractor remains at the repair shop. I could believe the grass is growing wild knowing that I have no way to tame it. No "sheriff" to keep it in check. I look back two months ago when I was excited about getting the tractor out and mowing. Has the excitement of that first Spring mowing already become the drudgery of yet another chore? No, I don't believe it has become drudgery, but the excitement certainly has passed. And I continue to search for a replacement tractor. My new trimmer is awesome, but it is a too small to attempt to use on the entire lawn. Another day of rain and prime grass growing conditions are ahead. I wonder if the lawn will make it until Saturday for its next mowing? It is green, mostly. I enjoyed looking at the clear, deep blue sky behind the fully leafed and green trees on Saturday. The green grass of the lawn completed the image and I find it far more pleasant to regard than the brown lawns of the winter. So I encourage the grass to continue growing with the application of fertilizer, because I prefer the green and the mowing it requires to the alternative. 1. Impromptu parties are awesome. We had the first pool party of the year last evening. Best of all, we couldn't plan for it all day. 2. I was able to sleep during the middle of the day on my floatie in the pool. What could be better? 3. Summer is getting so close. The daylight is lasting longer and longer and we are getting so much done around the house. 4. Lilacs and hoses. What do they have in common? They occupy nearly the same space in my garden. 5. 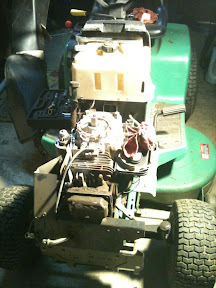 Shoping for a replacement garden tractor is not easy. And who really wants to spend money on a garden tractor? 6. How about the Orioles? When they used the cartoon bird as the symbol of the team, they were one of the best teams in baseball. Now that the cartoon bird has returned they are number one again. Coincidence? 7. Have you noticed the stock markets? Can you believe that Greece is behind the current problems? 9. The rain is coming again. Ugh! The weekend revolved around a trifecta of activity. Friday night we traveled to Nationals Park to watch the Orioles continue their fantastic season. They defeated the Nationals in eleven innings. I discovered that Orioles fans are far more polite when traveling into hostile parks than are the Red Sox and Yankees fans are that I get to meet at Camden Yards. 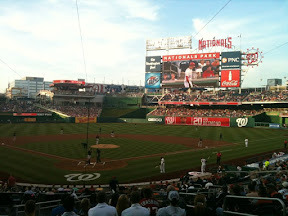 Nationals Park is a great pace to watch baseball and the evening was awesome. Yesterday was a day devoted to yard work and trying to find a new tractor. By 7:30 am, I was looking at Craigslist possible replacements. Too bad that one did not start. By 9 am, we had driven about 20 miles to look at another. Disappointed, we did not buy that one either. 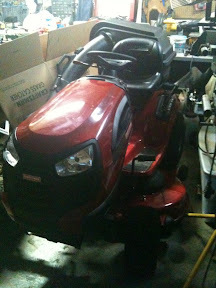 Fortunately, the neighbor let me borrow his and the lawns are mowed--but the search goes on. The afternoon took us to a lacrosse tournament. 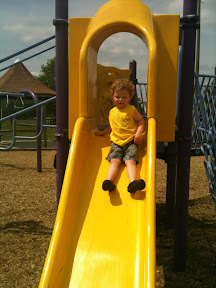 We had been watching Jax for the late morning while Ethan was spending time playing lacrosse. Sadly, it took so long to get to the tournament, we only saw the second half of Ethan's second game. But it was fun to see how much he has developed as a lacrosse player this season. A truly busy Friday night and Saturday--and there is still Sunday to contend with! Saturday evening was spent at the Baltimore Symphony reliving the music of the 60s and enjoying old memories. After a day of shopping, work, and sports what could be better? And the Baltimore Symphony does it best. They put on a great show that truly spanned the decade. Although they almost forgot the Beach Boys, they did get them in. The governor of Maryland, Martin O'Malley, who has presidential aspirations, has succeeded in firmly placing Maryland into the top five states with the highest personal tax rates this week. Did he do this himself? Well, essentially yes he did! By creating a no fault situation in which no one needs to accept responsibility for raising taxes. The legislature will blame the governor for calling the special session and having no other alternative. The governor can correctly point out that it was the legislature which actually passed the bills raising the taxes. But in my mind--they are both at fault for not managing the budget and the state better to have to resort to such oppressive tactics. Here is the kicker--now Maryland will be going back to employers and having them begin withholding taxes at the new higher rate retroactive to the beginning of the year! The year is almost half completed. I am amazed that so many elected officials can be oblivious to the consequences. This, after all, is an election year and as of right now my vote goes to anyone who voted against the tax increase. The day of uneven and increasing tax rates must come to an end. It is simple--which taxpayers are fueling the economic recovery? I am becoming an advocate for a flat tax with no exemptions! It is only May, and I know many people have short memories--but we have to remember the tax increases when we vote in November. An article in the Wall Street Journal yesterday really intrigued me. North Dakota passed Alaska to become the number 2 oil producing state. I guess I thought that Alaska had been the number one state all along. Turns out that Texas is the number 1 oil producing state. It all goes to show how much oil the shale in North Dakota is capable of producing. And there may be even more in Ohio. Contrary to what we have been led to believe, the U.S. is beginning to increase oil production. Can we meet our needs? Probably not. As the Wall Street Journal reports: North Dakota is likely to hold onto the No. 2 spot, as Alaska's output has steadily declined over the past decade. Six years ago, Alaska produced about eight times more oil than North Dakota. Wow--we can continue to pollute our planet and deplete its resources for a few more decades. My racquetball has been awful lately. And I mean totally miserable. It is following the problems going on in my life with my shoulder and now my cubital tunnel syndrome. But worse, I am not moving and seeing the ball--it is like I am playing in slow motion. Last night I got smoked like I wasn't even on the court. I am frustrated. To say that I definitely do not have the "eye of the tiger" right now would be a understatement. Playing so miserably really takes the fun out of the game. I hate losing--don't get me wrong, but losing when I am playing well is a lot more palatable than just acting like road kill on the court. I am like road kill. But I keep playing because I figure there is no way to get out of a funk unless I keep trying. Every day is a new day. Maybe it is just like an extended hitting slump that some baseball players go through. Rain, rain, and did I say more rain? Yesterday was one of those days that we actually need every so often. Rain to replenish the earth and continue the springtime growth. My lawn is growing out of control--I am not looking forward to trying to get it back under control. If only I had a lawn mower--mine is still in the shop. But the lawn is too wet to mow right now, anyway. Rain is necessary to keep the growth and green going. It is still raining this morning and promises to be a wet and dreary day. Not that that matters as I work under the cold, uncaring glow of fluorescent lighting. Makayla hates the rain. She won't go out in the yard to do her business and it almost comical to watch her try to find a dry place under the bushes to pause for her morning constitutional. The drive to work should be especially trying--the roads tend to clog when it rains and the impatient drivers push the tolerance of the rest of us by trying to creat speed where none should exist. Uncaring, the rain will continue to fall. 1. It is not just about grapes, but it is about wine. 2. Mother's Day is a celebration of life and love. 3. Cats and dogs living together. 4. Monday's come too soon and weekends are too short. 5. Why does it seem that for every new technology deployment we take one step forward and a half step backwards? I spent a couple off hours yesterday wandering through the vineyards at Keswick in Virginia with the winemaker, Stephen, and the owner, Al. We did a two hour walking tour that covered almost every aspect imaginable of vine growing and more importantly--wine making. My take away: It all begins in the vineyard. 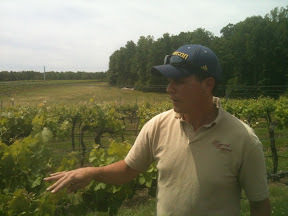 Along the way we discussed soils, pests, sunlight and the hot and cool side of the vines. 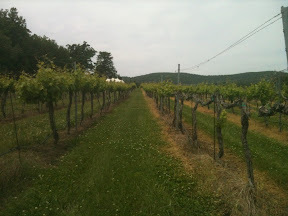 There was a fabulous discussion about pruning the vines and even how many vines are planted in an acre (900). We even had the opportunity to discuss the process of changing over the grapes grown by the winery and discovered that Keswick is no longer growing malbec, replanting that block with merlot and experimenting with vine density. Along with the discussion of the vines and growing, of course, was sampling the end product. Along the walk, strategically placed coolers of wine and barrel samples were positioned to help remind us of what the end product--wine, is all about. It is not about growing grapes, it is about making wine. I heard that somewhere. I believe I live an ordinary life. It is not filled with the trials of being superstar or a heroic political leader (are there any out there anymore?) I blend into the background fabric of life and existence. Yet, my life is not boring. No, in fact each day is filed with people who are fun and exciting to talk to and spend time with . My daily activities, while at times seemingly mundane, allow me to express my inner self and make a contribution which I believe is important. Life can be ordinary--but it certainly does not need to be boring. Would I really want a life that is not ordinary? I think not. I do not long to live a life where my time is managed, my appearances monitored, and every word dissected for its true or double meaning. I enjoy my life where early on a Saturday morning I can drink coffee, have my dog at my feet, and tap a few sentences on my iPad to help my make sense of what happened yesterday or what will be going on today. And not really worry if anyone else even that I am awake. A life where stopping to smell the flowers--or even notice them, does not make me late for some over inflated appointment. Ordinary does not mean without purpose. Life has purpose, even more so when ordinary. As I reflect on life and the meaning of the word ordinary--I believe that I strive to be ordinary. Because hidden in the meaning of ordinary is the word normal and that is reassuring. Although I often long for silence and serenity, there are times when silence is not the desired end state and actually signifies a problem. Such a situation occurred last evening. The peace associated with my weekly experience aboard my lawn tractor communing with my lawn was broken as the tractor sputtered and died. An evening lost in trying to unsuccessfully troubleshoot the problem which has the tractor laying in many parts throughout my garage. I know what is not working--but I can't get into it. Sounds like a new engine is needed. Ugh! And the grass keeps growing. Well is it Springtime. Maybe I'll buy a hay baler. The pool has been open for almost two weeks already--and other than putting my feet into it, I have yet to enjoy except to look at it. I have spent time cleaning it and putting the chemicals into it to make the water perfect. Pools are really demanding when they are first opened--and mine is no exception. But even tough I have not yet jumped into it, there is something peaceful about looking at a swimming pool waiting for the fun to begin. Last evening I spent more time getting the pool ready, I used the blower to get the recently fallen leaves off the deck before the wind blew them into the water. I also confirmed that the chemicals are balanced--it wasn't as bad as I had been worried once I used a test strip that gave accurate results. Aside from terrifying the cat, totally accidentally, while using the gas powered blower--it was a great afternoon. So far, by my unscientific count, I have spent about 9 hours working on the pool to get it ready and 0 hours in the pool swimming. But I still enjoy just sitting outside, by the pool, thinking of 90 degrees and mid-summer refreshment. My cat, Riordin, and dog, Makayla, are extremely jealous of each other. The more attention one of them gets, the more the other tries to get into the situation. It causes hilarious moments as the 35 pound dog attempts to become a lap dog and the cat tries to beg like a dog for things he doesn't even like. 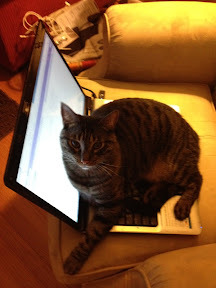 It gets a bit over the top when the cat tries to sit on my keyboard while the dog is getting her head scratched. It gets even more humorous when Riordin is on my lap on the couch and Makayla jumps up and tries to get her head between my hand and Riordin. I know they like each other because there are no claws or screeching (as cats sometimes do) when this happens. Well, at least life is mostly harmonious. The competition is friendly, or so it seems. They even play together at times--well Riordin takes a friendly swat at Makayla (with his claws retracted). Makayla has been known to give Riordin a friendly lick--although I think cats really hate that. Standing in the family cemetery yesterday morning with so many of my extended family brought back memories of having been there before. Too recently, I had stood in nearly the same spot thinking about the fragility of life and the end that I will someday face. The minister's words of comfort and of the assurance of hope were almost overcome by the grief of the moment. I believe those words and I know they are true--I just wish I didn't have to experience these times in order to really deal with my hope in the future. I can't understand why we have to experience such soul wrenching sorrow in order to be convinced of the promise of eternity. After the reason for which we had gathered, I was privileged to walk with my Mom around that cemetery to revisit the final resting places of many relatives. I remembered happy days and parties and celebrations. I thought about a trip to the old, now gone truck factory with an uncle. I remembered visits to great-grandma's house when I was a young boy. One visit was during the Cuban Missile Crisis and I remember being scared by the discussion about missiles and the "bomb" that the adults were having. Cemeteries are peaceful, by design. And our walk was satisfying and unhurried. The monuments all have a story about a life that they represent. Walking next to my Mom, I reconnected with my family and my history. As we walked, I also learned about many of her teachers and friends who have already passed.I heard stories about how they were related and how they had interacted. So many people and so many memories still alive in her mind and now mine. I have never been afraid of cemeteries and have always been in awe of the histories of the many lives that can be uncovered. While often called the final resting places, I know that our loved ones are not there, they have moved on across the bridge into eternity. As a result, I prefer to think of cemeteries as a place to pause and find the stories waiting to be rediscovered and memories to be rekindled. 1. Extended family gatherings are a blessing and they happen too infrequently. 2. I went into a time warp driving north from Maryland. The trees are only just beginning to leaf. 3. Is it funny or scary when Makayla decides she needs to sit on my lap while I'm driving? 4. Don't look now, but the team from Baltimore has the best record in baseball and they just swept Boston in Fenway Park for the first time since 1994. 5. Why is it that the British royals still garner so much news in the U.S.? Saturday is a day for sports it seems. Soccer and lacrosse and baseball are the big sports in our area right now. 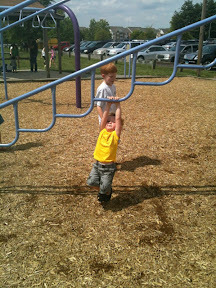 Yesterday morning, Jax had a soccer game and during the game Ethan and Lucas found entertainment on the local play ground. 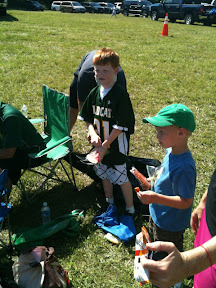 I did miss most of the game watching the boys play--but the day was warm and the sun bright so it wasn't all bad. 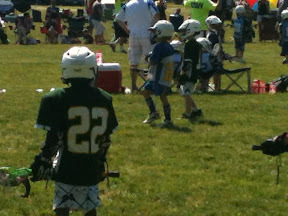 I am a bit sad that somehow we missed going to E's lacrosse game during the afternoon where he tallied two goals. But we did get to spend the morning together and enjoy a nice lunch. Then it was off t the house to work in the yards and around the pool. Why is it thought that there is always more work to do around the house on a nice day than there is time and energy to get it all done? At least the morning was enjoyable. It is not just the miles--it is an entire lifetime and state of mind. From Fantasyland and the carefree joys of childhood punctuated by happy stories and scary monsters, and into the reality of life and living. A small town boy living in the big metropolitan area cheering for an "I think I can" baseball team who this year keep finding ways to win rather than discovering new and more painful ways to lose. I know life can be simpler--but can it be better? Family and friends make it all work day after day. And the escape back to Fantasyland, whether Disney or the beach, provide the much needed pause in the middle of the frenetic pace of life. Tomorrow I am off again to Danby and family. The counterpoint to Disney yet the same pause in the frenetic pace of life. There is no fantasy in Danby--just a rugged reality. Maybe in their extreme difference they are almost the same, Disney and Danby. Sometimes, it seems, mowing the lawn can be an important interlude in the cycle of the day's activities. Although technically work, there is so much more to mowing my lawn. It is a time to grasp how things are growing and developing. Last evening, as I was mowing, I noticed the plums developing on my trees. They are growing bigger and I dream of harvesting them and enjoying their sweet taste. Truth is, the squirrels get to them before I do and I get to enjoy precious few of them. But I enjoy my plum trees--they are the first trees to blossom in the Spring and the first to fruit in the mid-summer. I also noticed how the grasses around the pool are rapidly growing to achieve their full height and provide the privacy screen that I so enjoy. Life has a way of getting out of control and the time spent mowing the lawn gives me the opportunity to review the activities of my life and get them back into their proper order. To say that I look forward to mowing the lawn is not entirely correct, but I do appreciate the time to pause and reflect away from my phone and iPad. My mind is always turning while I am mowing--and when the task is completed and the mower is back into its spot in the garage, my life always seems to be a more organized. No--I will not mow your lawn, too! One lawn a week is enough! It is with a great deal of sadness that I report the passing of my Aunt Janice yesterday morning, after a short, incredibly sudden accident. 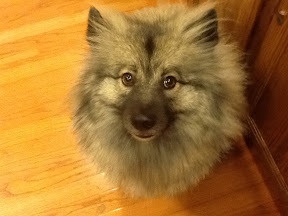 Se was a faithful reader of my blog (one of my few) and the last surviving sibling of my Mom. I was fortunate to have the opportunity to gather with the family around her bed on Monday night and to reminisce of our childhood and the closeness that we all used to share. I realized that I have become a bit distant--and we need to tighten up the bond that we call family. I always looked for and enjoyed Aunt Janice's comments on my blog posts--she usually had something interesting to write. I enjoyed seeing her reaction to the items I wrote. I have many fond memories of growing up and knowing her and all of my cousins--we never understood back then in the safe 60's (yup, I wrote it) how our lives would develop and how fragmented we would become as adults. I read an awesome book a few months ago titled: Heaven is for Real. I highly recommend it. It made me cry for joy. Some of what was written within its pages comforts me now. When standing on the edge of eternity, it is easy to wonder if it is all real. Yeah, it is. A pastor once told me that death is a lot like moving and changing your address. You are still alive, you just don't live at the old house anymore. Although cell phones don't reach into heaven, yet. For me? I'll always remember her riding in my car last summer and how much she enjoyed it and remarked that it reminded her of when she was a teenager. The bats were flying last evening as Chris and I sat out on in our outdoor living room to enjoy one of the first, nice evenings of Spring. The trees have filled in the voids nicely and we again have our our own private piece of the world. We reflected upon the events of the past couple of days and counted the blessings that we have been given for no good reason other than God loves us. I reflected upon the message in church on Sunday which reinforced the concept that God owns everything and gives me the use some things for my enjoyment and his pleasure. I enjoy the backyard that he has seen fit to surround with a leafy canopy of green. 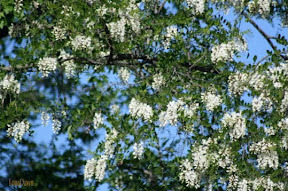 I leaned forward to smell the honey locust blossoms on the breeze. And smiled remembering the gardenias I found in Disney just over a week ago. A world to enjoy, if only I would slow down. The people who stand with you during a crisis. They also rejoice when good things happen. And very often they help make good things happen. I was reminded of a bible verse, Job 2:13,where Jobs friends join him after calamity takes away his family and possessions. They sat with him for seven days and said nothing. That is hard to do. But they were there. Presence--is more important than words. Being there is the best form of comfort. Sometimes the best thing to say, is nothing at all.